<h2>Memory-jogging robot to keep people sharp in ‘smart’ retirement homes</h2><br /><p><a href="https://ec.europa.eu/eurostat/statistics-explained/index.php/Population_structure_and_ageing#The_share_of_elderly_people_continues_to_increase" target="_blank" rel="noopener noreferrer">Almost a fifth</a> of the European population are over 65 years old, but while quality of life for this age bracket is better than ever before, many will at some point suffer from a decline in their mental abilities.</p> <p>Without adequate care, cognitive abilities can decline quicker, yet with the right support people can live longer, healthier and more independent lives. Researchers working on a project called&nbsp;ENRICHME have attempted to address this by developing a robotic assistant to help improve mental acuity.</p> <p>‘One of the big problems of mild cognitive impairment is temporary memory loss,’ said Dr Nicola Bellotto from the School of Computer Science at the University of Lincoln in the UK and one of the principal investigators of ENRICHME.</p> <p>‘The goal of the project was to assist and monitor people with cognitive impairments and offer basic interactions to help a person maintain their cognitive abilities for longer.’</p> <p>The robot moves around a home providing reminders about medication as well as offering regular physical and mental exercises – it can even keep tabs on items that are easily misplaced.</p> <p>A trial was conducted with the robot in three retirement homes in England, Greece and Poland. At each location the robot helped one or more residents, and was linked to sensors placed throughout the building to track the movements and activities of those taking part.</p> <p>‘All this information was used by the robot,’ said Dr Bellotto. ‘If a person was in the bedroom or kitchen the robot could rely on the sensors to know where the person is.’</p> <p><iframe src="https://www.youtube.com/embed/98bVFkKoRl0" width="590" height="332" frameborder="0" allowfullscreen="allowfullscreen"></iframe></p> <p>The robot was also kitted out with a thermal camera so it could measure the temperature of a person in real time, allowing it to estimate the levels of their respiration and heartbeat. This could reveal if someone was experiencing high levels of stress related to a particular activity and inform the robot to act accordingly.</p> <p>This approach is based around a principle called ambient assisted living, which combines technology and human carers to improve support for older people. 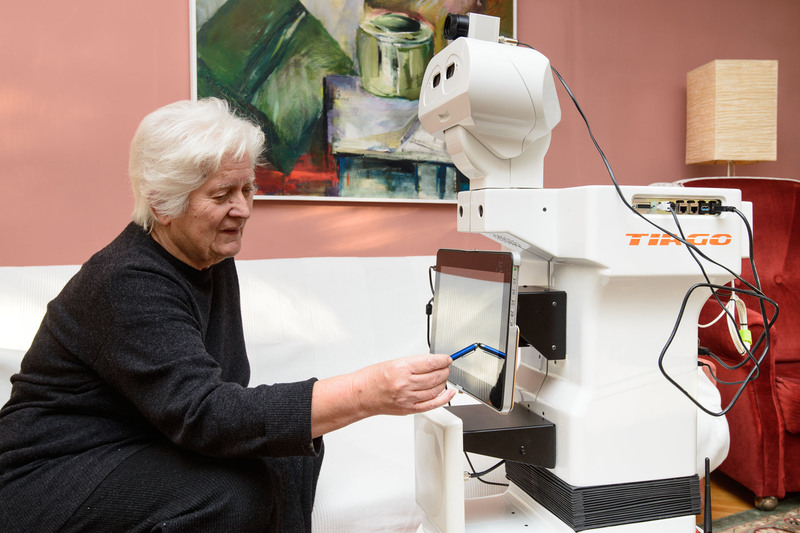 In ENRICHME’s case, Dr Bellotto said their robots could be operated by healthcare professionals to provide tailored care for elderly patients.</p> <p> <div class="quote-view quotesBlock quote_horizontal"> <div class="quotesTop"><img src="https://horizon-magazine.eu/sites/all/themes/horizon/images/quotes_top.png" alt="" title="" /></div> <p>‘One of the big challenges we have in Europe is the high number of elderly people that the public health system has to deal with.’</p> <blockquote><p>Professor María Inés Torres, University of the Basque Country, Spain</p></blockquote> <div class="quotesBottom"><img src="https://horizon-magazine.eu/sites/all/themes/horizon/images/quotes_bottom.png" alt="" title="" /></div> </div> </p> <p>The users involved in the trials showed high level of engagement with the robot they were living with – even naming it Alfie in one case – and also provided good feedback, said Dr Bellotto. But he added that it is still a few years away from being rolled out to the wider public.</p> <p>‘Some of the challenges we had were how to approach the right person in these different environments because sometimes a person lives with multiple people, or because the rooms are small and cluttered and it is simply not possible for the robot to move safely from one point to another,’ he said.</p> <p>Dr Bellotto and his team are now applying for funding for new projects to solve the remaining technical problems, which hopefully one day will help them take the robot one step closer to commercialisation.</p> <p>This type of solution would help increase people's physical and psychological wellbeing, which could help to reduce public spending on care for older people. In 2016 the total cost of ageing in the EU was <a href="https://horizon-magazine.eu/article/visualise-your-goals-and-never-give-eu-young-scientist-winner-modestas-gudauskas_en.html" target="_blank" rel="noopener noreferrer">25% of GDP</a>, and this figure is expected to rise in the coming decades.</p> <p><strong>Ageing populations</strong></p> <p>‘One of the big challenges we have in Europe is the high number of elderly people that the public health system has to deal with,’ said Professor María Inés Torres, a computer scientist from the University of the Basque Country in Spain.</p> <p>Older people can fall into bad habits for a variety of reasons, such as&nbsp;being unable to go for walks and cook healthy meals because of physical limitations. The loss of a loved one can also lead to reduced socialising, exercising or eating well. These unhealthy habits are all exacerbated by depression caused by loneliness, and with <a href="https://ec.europa.eu/eurostat/cache/infographs/elderly/index.html" target="_blank" rel="noopener noreferrer">32% of people aged over 65 living alone</a> in Europe, this is a significant challenge to overcome.</p> <p>‘If you are able to decrease the correlation between depression and age, so keeping people engaged with life in general and social activities, these people aren’t going to visit the doctor as much,’ said Prof. Torres, who is also the coordinator of EMPATHIC, a project that has developed a virtual coach to help assist elderly people to live independently.</p> <p>The coach will be available on smart devices such as phones or tablets and is focused on engaging with&nbsp;someone to help them keep up the healthier habits they may have had in the past.</p> <p>‘The main goal is that the user reflects a little bit and then they can agree to try something,’ said Prof. Torres.</p> <p>For instance, the coach may ask users if they would like go to the local market to prepare their favourite dinner and then turn it into a social activity by inviting a friend to come along. This type of approach addresses the three key areas that cause older people’s health to deteriorate, said Prof. Torres, which are poor nutrition, physical activity and loneliness.</p> <p>For the coach to be effective the researchers have to build a personal profile for each user, as every person is different and requires specific suggestions relevant to them. They do this by building a database for each person over time and combining it with dialogue designed around the user's culture.</p> <p>The researchers are testing the virtual coach on smart devices with 250 older people in three areas – Spain, France and Norway – who are already providing feedback on what works and what doesn’t, which will increase the chances of the virtual coach actually being used.</p> <p>By the end of the project in 2020, the researchers hope to have a prototype ready for the market, but Prof. Torres insisted that it will not replace healthcare professionals. Instead she sees the smart coach as another tool to help&nbsp;older people live a more independent life – and in doing so reduce the pressure on public healthcare systems.</p> <p><em>The research in this article was funded by the EU. If you liked this article, please consider sharing it on social media.</em></p> <br /> <img src=”http://www.google-analytics.com/collect?v=1&tid=UA-40077089-1&cid=memory-jogging-robot-to-keep-people-sharp-in-‘smart’-retirement-homes&t=event&ec=republish&ea=read&el=memory-jogging-robot-to-keep-people-sharp-in-‘smart’-retirement-homes&cs=republish&cm=republish&cn=republish&cm1=1" /> This post <a href="https://horizon-magazine.eu/article/memory-jogging-robot-keep-people-sharp-smart-retirement-homes.html">Memory-jogging robot to keep people sharp in ‘smart’ retirement homes</a> was originally published on <a href="https://horizon-magazine.eu/">Horizon: the EU Research &amp; Innovation magazine | European Commission</a>. Almost a fifth of the European population are over 65 years old, but while quality of life for this age bracket is better than ever before, many will at some point suffer from a decline in their mental abilities. Without adequate care, cognitive abilities can decline quicker, yet with the right support people can live longer, healthier and more independent lives. Researchers working on a project called ENRICHME have attempted to address this by developing a robotic assistant to help improve mental acuity. ‘One of the big problems of mild cognitive impairment is temporary memory loss,’ said Dr Nicola Bellotto from the School of Computer Science at the University of Lincoln in the UK and one of the principal investigators of ENRICHME. The robot moves around a home providing reminders about medication as well as offering regular physical and mental exercises – it can even keep tabs on items that are easily misplaced. A trial was conducted with the robot in three retirement homes in England, Greece and Poland. At each location the robot helped one or more residents, and was linked to sensors placed throughout the building to track the movements and activities of those taking part. The robot was also kitted out with a thermal camera so it could measure the temperature of a person in real time, allowing it to estimate the levels of their respiration and heartbeat. This could reveal if someone was experiencing high levels of stress related to a particular activity and inform the robot to act accordingly. This approach is based around a principle called ambient assisted living, which combines technology and human carers to improve support for older people. In ENRICHME’s case, Dr Bellotto said their robots could be operated by healthcare professionals to provide tailored care for elderly patients. The users involved in the trials showed high level of engagement with the robot they were living with – even naming it Alfie in one case – and also provided good feedback, said Dr Bellotto. But he added that it is still a few years away from being rolled out to the wider public. ‘Some of the challenges we had were how to approach the right person in these different environments because sometimes a person lives with multiple people, or because the rooms are small and cluttered and it is simply not possible for the robot to move safely from one point to another,’ he said. Dr Bellotto and his team are now applying for funding for new projects to solve the remaining technical problems, which hopefully one day will help them take the robot one step closer to commercialisation. This type of solution would help increase people's physical and psychological wellbeing, which could help to reduce public spending on care for older people. In 2016 the total cost of ageing in the EU was 25% of GDP, and this figure is expected to rise in the coming decades. ‘One of the big challenges we have in Europe is the high number of elderly people that the public health system has to deal with,’ said Professor María Inés Torres, a computer scientist from the University of the Basque Country in Spain. Older people can fall into bad habits for a variety of reasons, such as being unable to go for walks and cook healthy meals because of physical limitations. The loss of a loved one can also lead to reduced socialising, exercising or eating well. These unhealthy habits are all exacerbated by depression caused by loneliness, and with 32% of people aged over 65 living alone in Europe, this is a significant challenge to overcome. ‘If you are able to decrease the correlation between depression and age, so keeping people engaged with life in general and social activities, these people aren’t going to visit the doctor as much,’ said Prof. Torres, who is also the coordinator of EMPATHIC, a project that has developed a virtual coach to help assist elderly people to live independently. The coach will be available on smart devices such as phones or tablets and is focused on engaging with someone to help them keep up the healthier habits they may have had in the past. ‘The main goal is that the user reflects a little bit and then they can agree to try something,’ said Prof. Torres. For instance, the coach may ask users if they would like go to the local market to prepare their favourite dinner and then turn it into a social activity by inviting a friend to come along. This type of approach addresses the three key areas that cause older people’s health to deteriorate, said Prof. Torres, which are poor nutrition, physical activity and loneliness. For the coach to be effective the researchers have to build a personal profile for each user, as every person is different and requires specific suggestions relevant to them. They do this by building a database for each person over time and combining it with dialogue designed around the user's culture. The researchers are testing the virtual coach on smart devices with 250 older people in three areas – Spain, France and Norway – who are already providing feedback on what works and what doesn’t, which will increase the chances of the virtual coach actually being used. By the end of the project in 2020, the researchers hope to have a prototype ready for the market, but Prof. Torres insisted that it will not replace healthcare professionals. Instead she sees the smart coach as another tool to help older people live a more independent life – and in doing so reduce the pressure on public healthcare systems.